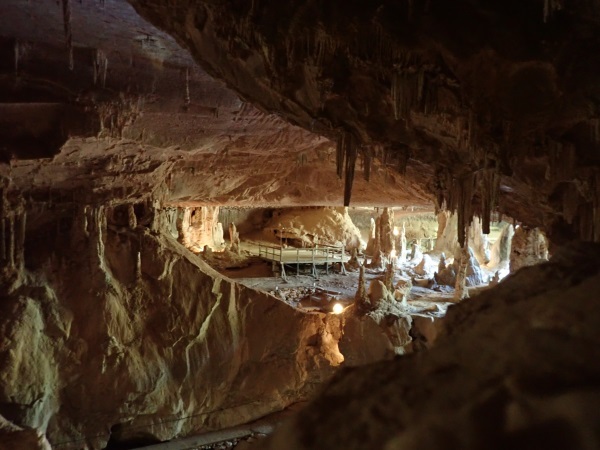 Ever since I started caving 10 years ago, all I ever heard from Jeff B was “you’ll never get me inside a cave!” Our trip to Abercrombie Caves this weekend probably wouldn’t be blog-worth except for the fact that Jeff actually went caving! 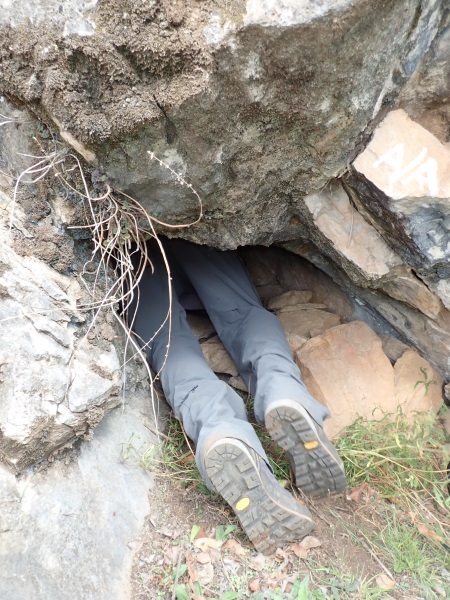 And not some big-arse cave but he stuck his head inside tiny little holes! 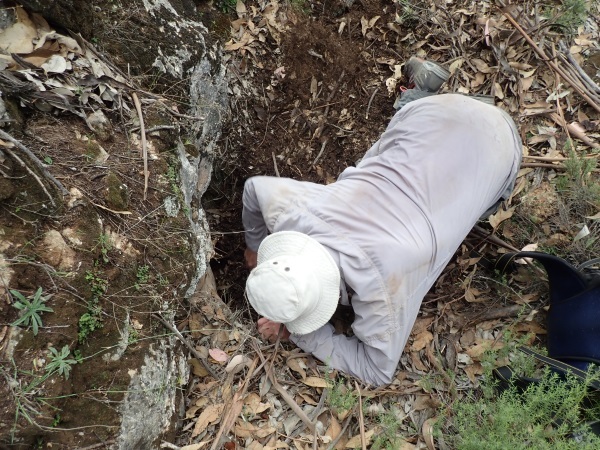 The aim of this weekend at Abercrombie was to help Rod S find some missing tags … caves that had been found and tagged in the mid 80s (they didn’t have GPSs in those days, so just recorded the general vicinity of the caves, if that!) and some of the caves hadn’t been seen since. Rod’s been slowly trying to find them, and of the 100+ caves that have been tagged, he’s still missing about 30. With the Abercrombie Book in the works, Rod set aside two weekends to try to find some of the missing caves. Jeff B, Steve R, Alan C and I offered to give him a hand. 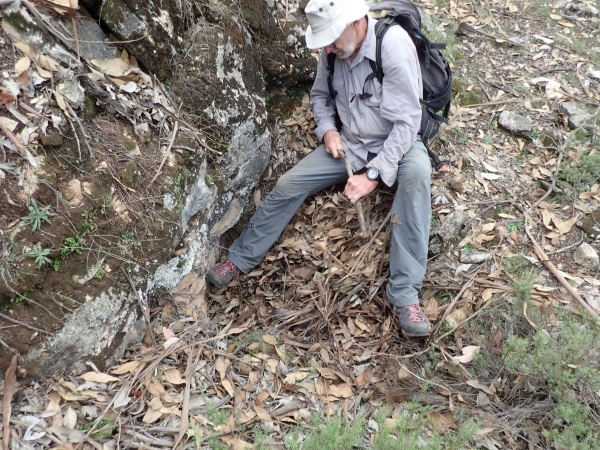 I had persuaded Jeff and Steve to come along as they’re primarily bush walkers (even though Jeff’s a member of MSS he doesn’t cave), and I thought they’d enjoy what we call “surface trogging”. We started out around 10am on Saturday morning, heading out for the Horse Run, an area that records indicated had a cave nearby. And within 10 minutes, we’d found the first cave that Rod had been looking for, right on the track, near an area that, in days gone by, they’d corralled horses. 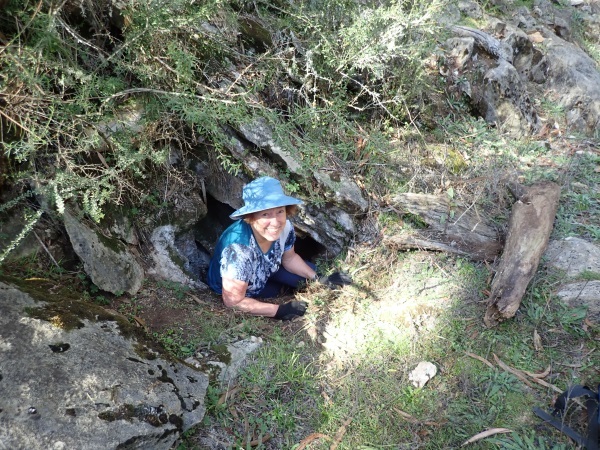 I dropped down into it to retrieve a soft drink can that was just inside the cave opening. I didn’t go much further as I didn’t have my helmet with me and wasn’t wearing overalls. We then headed up the valley, not sure if this was the area that was described as “North West Bluff”. 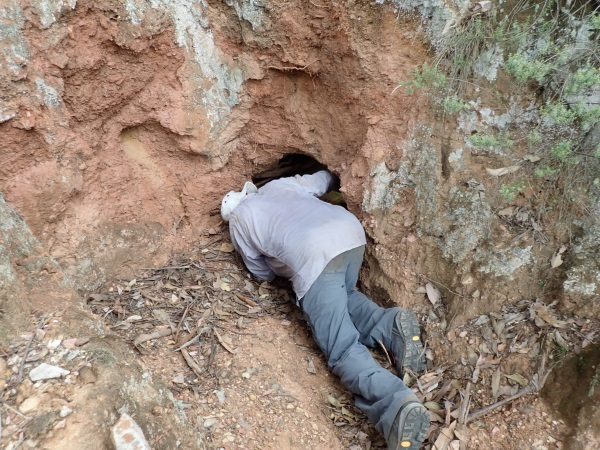 We looked around in the creek and found nothing so headed further up the valley to a rocky outcrop which was in a roughly north west direction, and struck pay-dirt, 6 caves all in the same area. One was exceptionally big; we got GPS grid references for all of them. We still had 2 to find in the area, particularly A-42 which should have been where we were but we hadn’t found it yet. We’d given up by this time and were crossing the creek and walking up to the road, when the tag for A-42 practically jumped out at us. And the biggest surprise of all, Jeff crawled in to have a look inside! Never thought I’d see the day. Next thing you know, we came to a depression and Rod said, “that looks like you might be able to dig through to a hole there”, and Jeff’s into it, his first “dig”. And the hole is still going with him digging down. He was actually able to get a 6′ stick down into the hole, definitely something that could use a big more excavation – a project for the future. There’s no stopping him now – into another bloody hole! We gave up exploring in the North West bluff – giving up on A-91 (I think that was it’s name) and headed back for lunch, Rod and Alan went one direction, we went another way, here they are above the Arch, you can hardly see them and gives you a good idea of how big the Arch is (apparently, the largest Arch in the Southern Hemisphere). 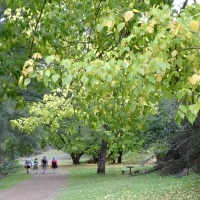 On the way back to the campground for lunch, the exotic trees are starting to get their autumn colours. After lunch we headed over to another area, just across from our campsite. We spent all afternoon there and didn’t find a single cave, more research needed. On the way back though, we found A-108, just off a walking track, it was camouflaged which is why it hadn’t been spotted it before. By this time we’d all had enough, so headed back to camp for beers and a hot shower … yes, they have hot showers at the Abercrombie campground. 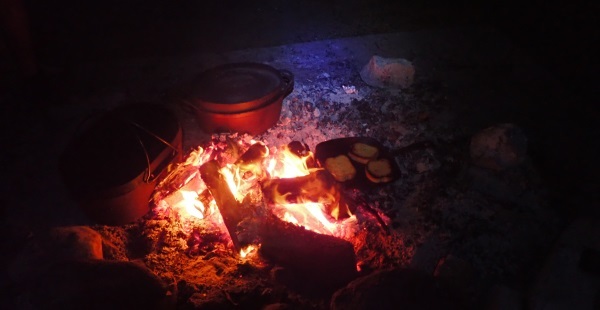 The campfire was stoked up and the guys prepared our gourmet dinner, everyone brought some part of the roast dinner and prepared and cooked their item, Rod’s preparing some of the vegies. 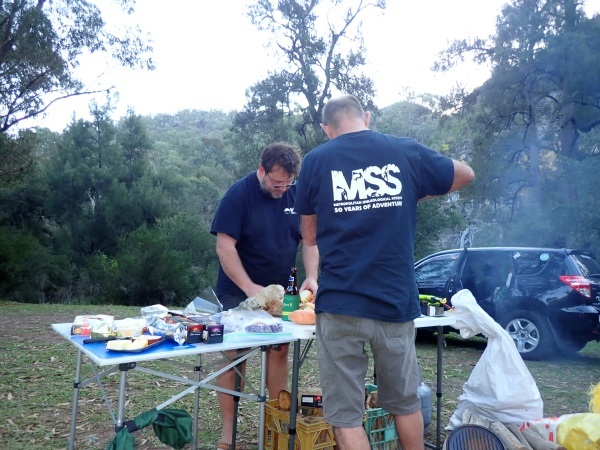 Rod and Jeff in their MSS shirts advertising the club! Alan brought a stack of firewood, we had more than we knew what to do with, so had a roaring fire. 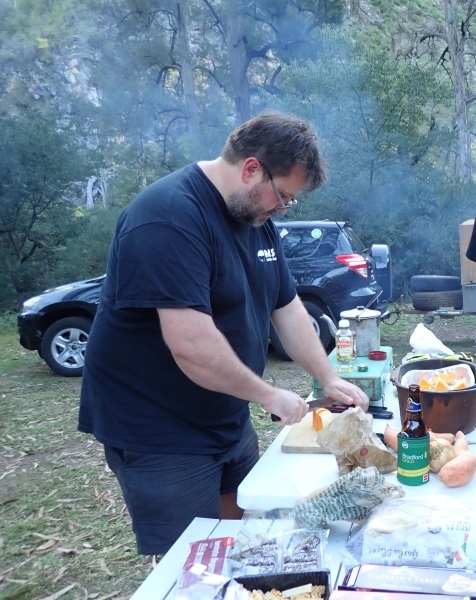 Camp ovens with vegies and Roast Pork plus garlic bread. Dinner was fantastic, thanks guys, all I had to do was bring the pork and co-ordinate everyone (pays to delegate). On Sunday, Jeff and I headed out looking for more tags, this time on the South Grove Bluff and Rod and Alan went off to do some cave surveying (Mosquito Cave). Jeff and I hunted around for an hour or so, found nothing, and were heading up to the top of a very, very steep hill where there was a likely looking rocky outcrop. All was going well until Jeff almost trod on a huge red belly black snake. Thankfully I didn’t see the snake and had no idea what had happened, but the next thing I knew, Jeff in his effort to get away from the snake that he thought was about to bite him, had overbalanced and fallen head over heels. I watched him roll down the slope, I thought he was falling to almost certain death, that’s how steep the hill was, and there was nothing to grab onto. He probably rolled/fell about 15m before coming to a stop. I picked up his hat and glasses and then got down to him to make sure he was ok, it was then I heard about the snake. He was very fortunate, only sustained grazes, cuts and bruising, could have been much worse. We decided that it would be best if we got ourselves off the slope it was just too steep (and away from the snake, who knows where it was), we had to drop down about 100m to get back to the creek and the track back to camp. 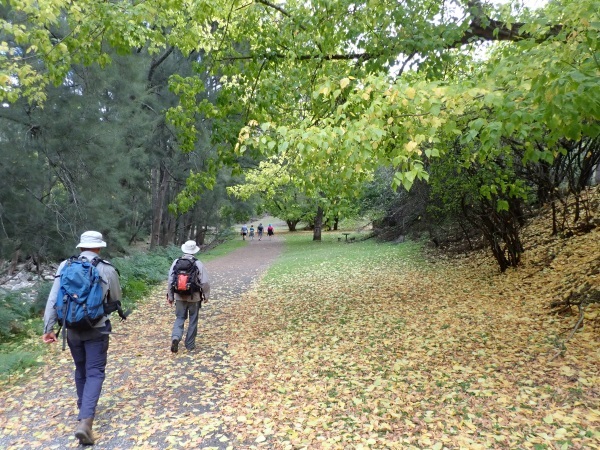 We spent the rest of the morning with Rod and Alan at Mosquito Cave, taking a brief walk through Bushranger Cave. On the walk back to camp, I got a good snap of the Dancefloor – a platform that was built in the Arch cave for dances in the old days (not sure when it was built, but has to be 50+ years ago). Snake and Jeff’s fall aside, it was a great weekend, and although I wouldn’t say Jeff’s hooked on caving now, I do think he’ll go again. Thanks Rod for organising the weekend and thanks to you, Steve and Alan for your company! 8 Responses to I never thought I’d see the day! There are various dates recorded for the construction of the dance floor in the “Hall of Terpsichore”. A booklet “The Abercrombie and Wellington Caves, New South Wales”, written by Kent Henderson in 1988 states the dance floor was built in 1854. 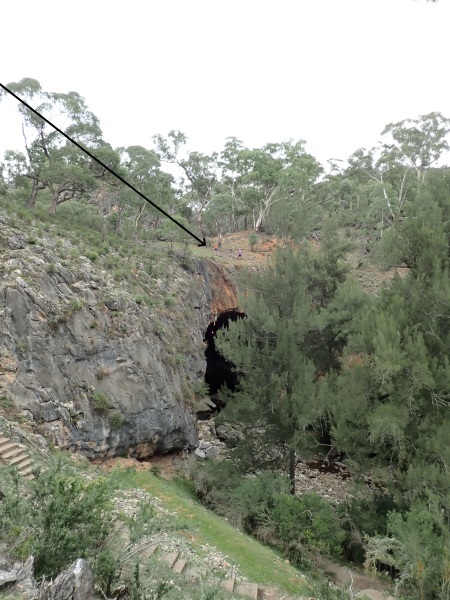 Another reference “Abercrombie Caves, Cave Chronicles” written by Ken Keck and Barry Cubitt in 1991, states the dance platform was erected in 1860 and was replaced by a more substantial structure in January, 1880, which is still in use today. Yes, I was feeling lazy and didn’t look up the data that I have here, and was erring on the side of caution by saying it was built recently (lol), thanks for setting the record straight David! As always, I am enjoying reading about your adventures. You see some of the most interesting places! I could do without the snake! I had an episode with a snake when I was in Costa Rica. Once was enough!! Glad your friend wasn’t seriously hurt. It was interesting to hear you talk about autumn. On my side of the world, I am finally seeing a few buds on the trees. Snow is almost gone, but we may get more this week. Broc’s place came close to flooding. He is in Marge and Jim’s house on the Mississippi. Yes, he was lucky with the snake! Lovely to hear from you again. What a beautiful place to go caving (I love Abercrombie Caves) and well done Jeff. You should come and car camp with us Adrienne next time I go (June), it is a great place the Arch is stunning and the campsite nice (gotta love the hot showers). Very enjoyable weekend, snake was a great specimen very shiny and fast but I was quicker shame I didn’t stay upright!! haha, better you than me, if I’d rolled down the hill as far as you did, there would have been much more bleeding!